Alison, of Kurberry.Etsy.com sent this fresh and airy book for our most recent book swap. Alison is currently living in Seattle for work, displaced from her usual home in Italy and all her usual papers and supplies. So for her, the travel theme is applied even as a result of the conditions under which the book was created. The colours and shapes are also reminiscent of summer vacations at the beach, blue skies, sea green oceans, and sails in the distance! 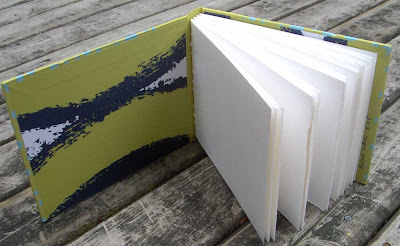 This is a hardcover album with decorative papers and book cloth on the spine. 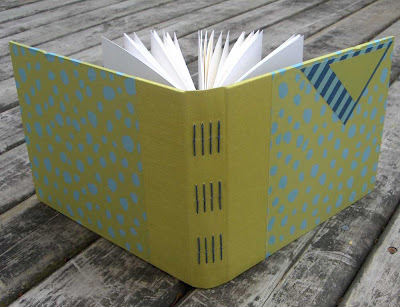 The binding is a pearl dash sewing through the spine. Check out more of her work in her Esty shop, Kurberry.Etsy.com. See all the books from Book Swap #4. Such an artful book...the colors and design are very appealing.